Ages 4 through 10. Here is a collection of enjoyable board games that can be used to teach speech sounds and remediate phonological processes. The kit includes full-color game boards, spinners, thinking cards, and reproducible worksheets. 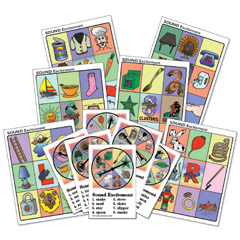 Activities are included for /r/, /s/, /l/, /t/, /k/, and phonological processes.